After I completed my duties in the Armed Forces, U.S. Navy, I immediately joined the nation’s workforce. I believe that among the most important responsibility in our lives is work, for ourselves and for society at large. Over the years I have performed public safety duties. In my jobs at Pan America Airlines and American Airlines, I worked as an aircraft maintenance technician, with responsibility for passenger and airline employee safety. As a current member of TWU Local 252, I am responsible for the safety of school children on the school bus that I drive. My work requires that I know and observe many state and federal laws and regulations. 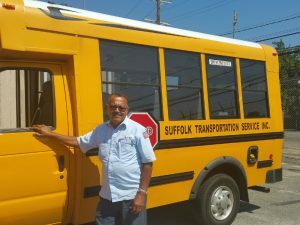 I am employed by Suffolk Transportation System and enjoy many benefits as a result of my union membership. My work is deeply satisfying as it rejuvenates me daily to deal with children from diverse backgrounds. Why would your union back Representative Lee Zeldin? He is responsible for the concealed carry reciprocity act. He is the one to co-sponsor the bill, despite police and firemen being against it. This is too serious an issue to allow this man to continue without regard to those of you who serve on the front lines. This would allow any Wyoming nut to come to NYC and to Suffolk county and conceal carry if their state allows it.